During the holidays, I’m always on-the-go. Every year since moving to Los Angeles six years ago, I fly to the Northeast to spend Christmas with family. But when Christmas is over, I always head back to Southern California to celebrate the new year. In contrast to the Northeast, where temperatures require heavy jackets and the world remains frozen and brown for a few more months, the end of December in Southern California feels fresh, alive and reinvigorating. During this time of year in LA, more frequent rain means the mountains are greener, flowers still bloom, the air is fresher and the skies are clearer (after it rains, visibility increases and you can see for miles and miles). Temperatures drop too — but it never gets too cold. 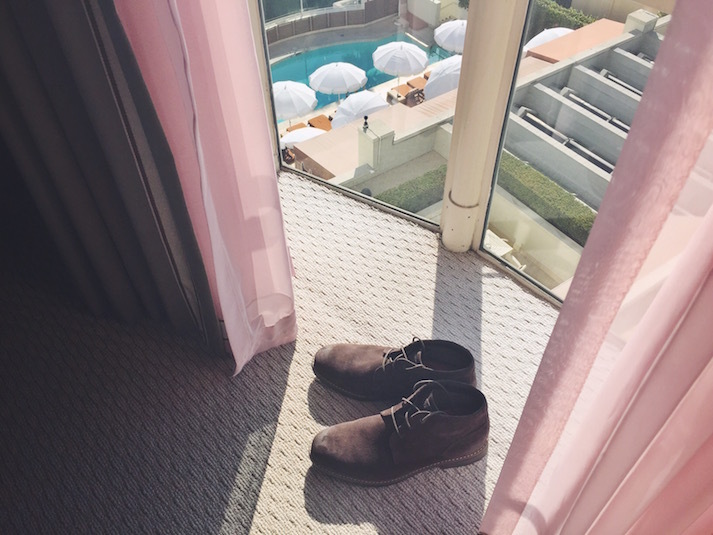 This New Year’s Eve weekend in LA, I went to opposite ends of the spectrum — on one end, hiking in the Santa Monica Mountains, and one the other, getting spiffed up to celebrate at LA’s sophisticated Sunset Tower Hotel. 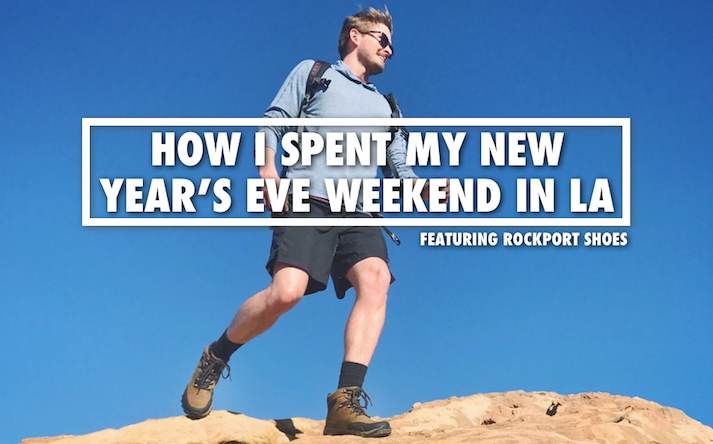 For both adventures, like so many others in 2016, I had a pair of Rockport boots on my feet. 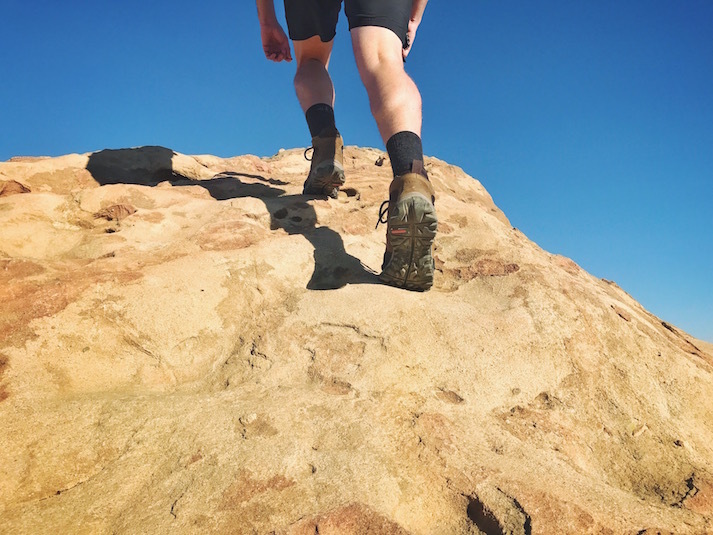 One thing I always like to do at the very end of the year in Southern California is take a hike (it just feels good to end the year moving and breathing in fresh air). As mentioned above, this time of year brings greener mountains, clearer skies and cooler temperatures, making it the perfect time to hit the trails. 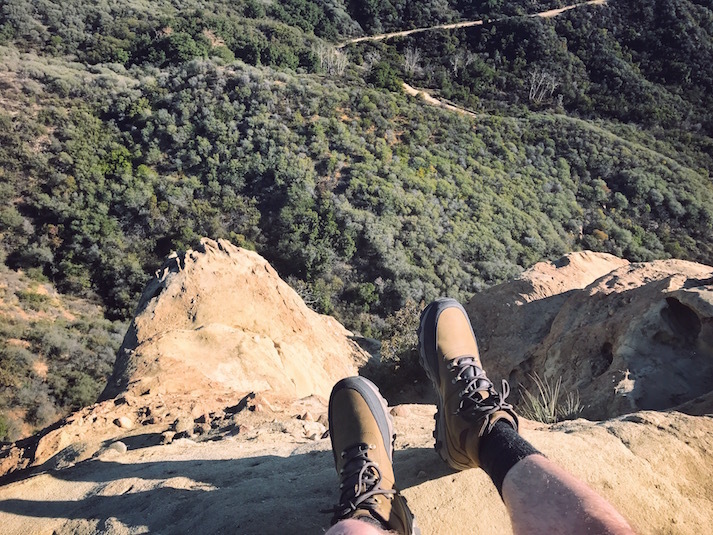 So on New Year’s Eve-Eve (the day before New Year’s Eve — December 30th) I decided to make the most of the beautiful day and hike one of my favorite places in the LA area — Topanga State Park in Topanga Canyon. 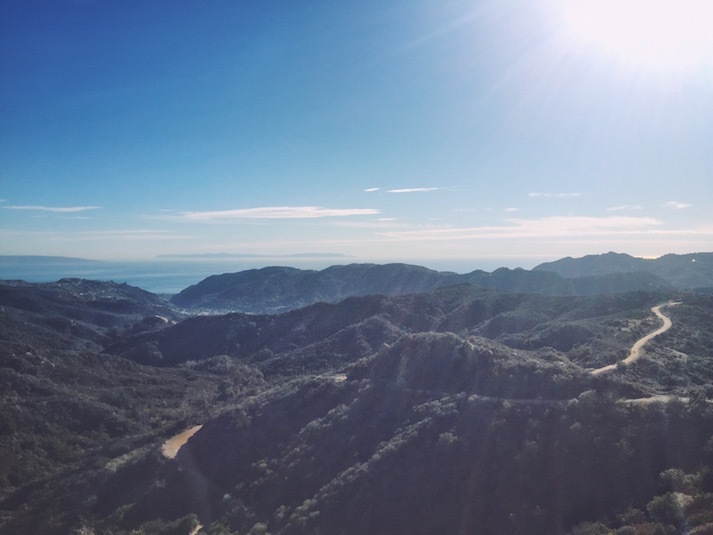 At only 30 minutes from LA (depending on where in the city you’re coming from), Topanga State Park feels a million miles away from the hustle and bustle of the city. 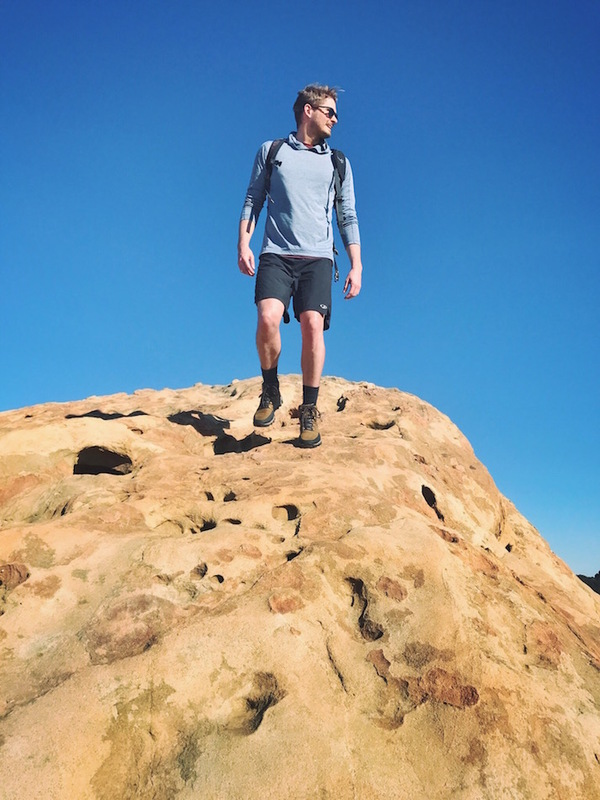 I’ve hiked a few different trails in the area, but on this occasion, I hiked the East Topanga Fire Road trail from the Trippet Ranch parking lot to Eagle Rock (click here for more info on hiking this trail). This out-and-back trail is just shy of two miles each way, is wide and groomed, and for most people, is fairly easy to complete. Good to know: There is very little shade on the trail so come prepared with sunscreen, sunglasses, a hat and water. Parking in the Trippet Ranch parking lot is $10 (you can pay at the parking machine with cash or card). Wearing my Rockport Cold Springs Plus Mudguard Boot. 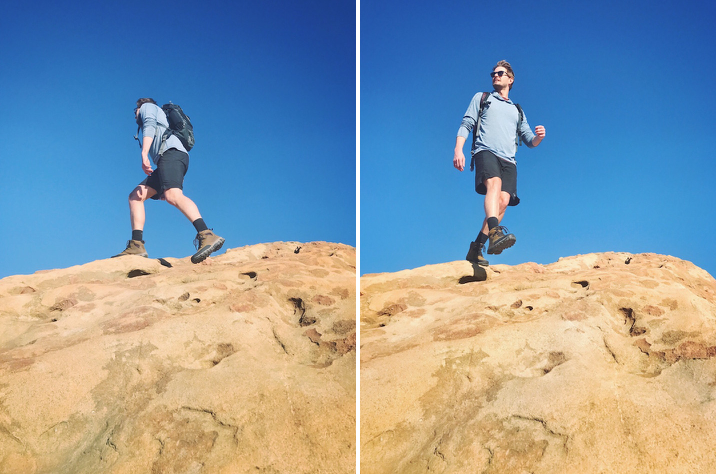 // For a mid-ankle boot with plenty of support, they’re incredibly lightweight — an important feature when choosing a hiking boot. The East Topanga Fire Road trail as seen from Eagle Rock. // Way out on the horizon you can see Catalina Island (I camped there a few months ago). On clear winter days like this one, the views in all directions never end. Eagle Rock, a massive rock outcrop juts out from the side of the mountain and is the perfect place to take in the views. It’s also a bit reminiscent of the surface of Mars. 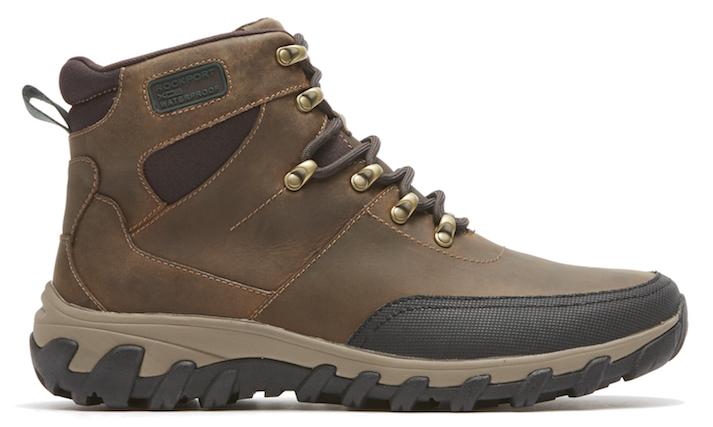 Featured Boots: Rockport’s Cold Springs Plus Mudguard Boot – With its rugged rubber outsole, these boots provide an outstanding amount of grip on the terrain beneath your feet — plus, the mid-ankle design offers up plenty of extra support. Right out of the box, the Cold Springs Plus Mudguard Boots are comfortable to wear and forgiving on your feet, thanks in part to the ADIPRENE® shock-absorbing heel and shock absorbing EVA midsole. These boots, however, really shine in wet weather with their Hydro-Shield® construction (i.e. 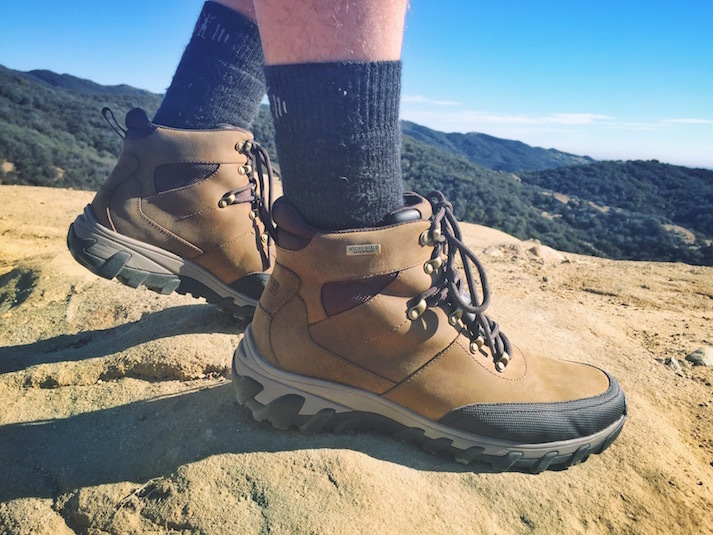 a suite of features designed to keep your feet dry) — so I’m looking forward to using them when I travel to the snow this winter. 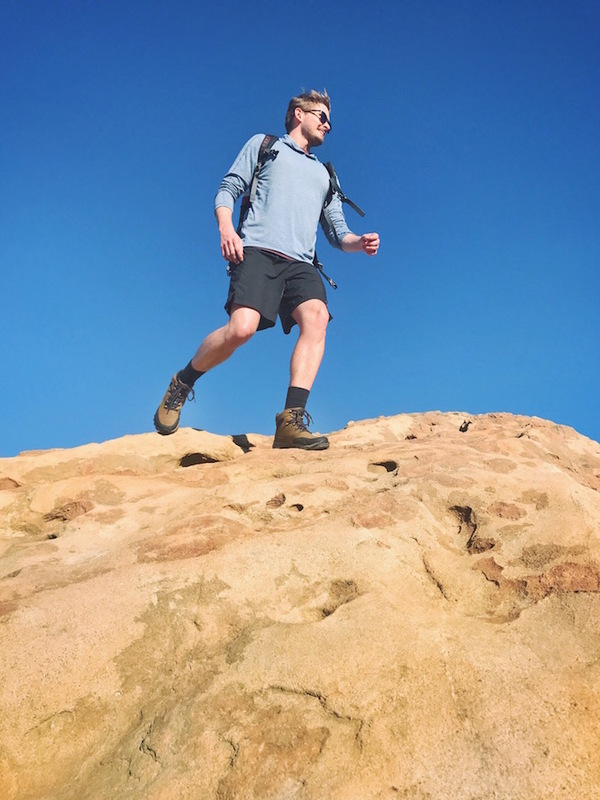 Taking a 180-degree turn from hiking in the Santa Monica Mountains the day before, my December 31st was spent at the sophisticated Sunset Tower Hotel. This legendary haunt ooze’s Old Hollywood style and is beloved by entertainment industry elite (seeing famous faces here is very common). Located on Sunset Boulevard along the Sunset Strip, I’d visited a few times prior for drinks at the bar — and for New Year’s Eve, it served as the perfect spot for a one-night staycation. 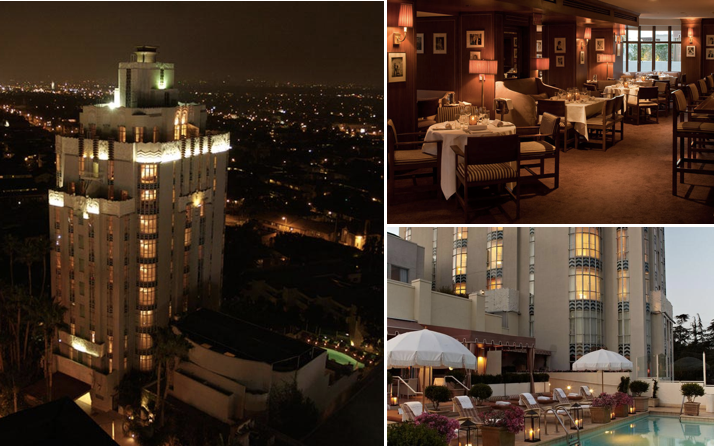 The Tower Bar (pictured top right, photo credit: Sunset Tower Hotel) is where I rang in the new year. This photo, however, doesn’t do the room justice. At night, The Tower Bar is very dark and private, lit by dim lights and flickering candles. 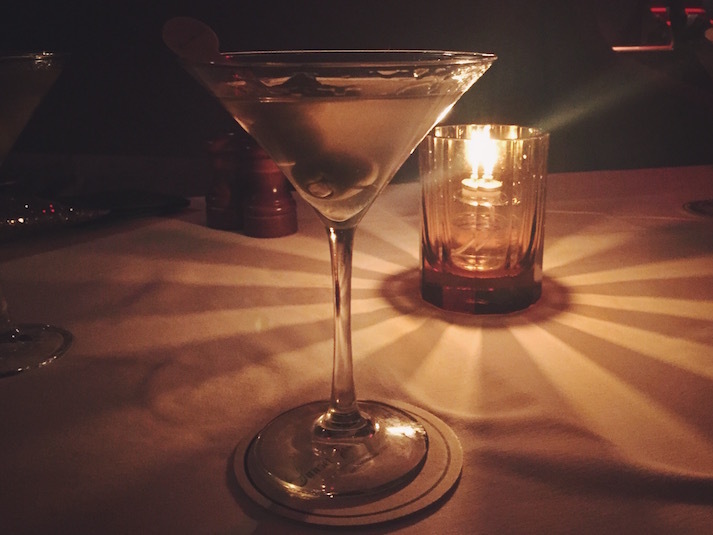 This ambiance, along with the dark walnut-paneled walls and plush seating areas tucked into private nooks, make it one of LA’s coziest restaurant/bars. 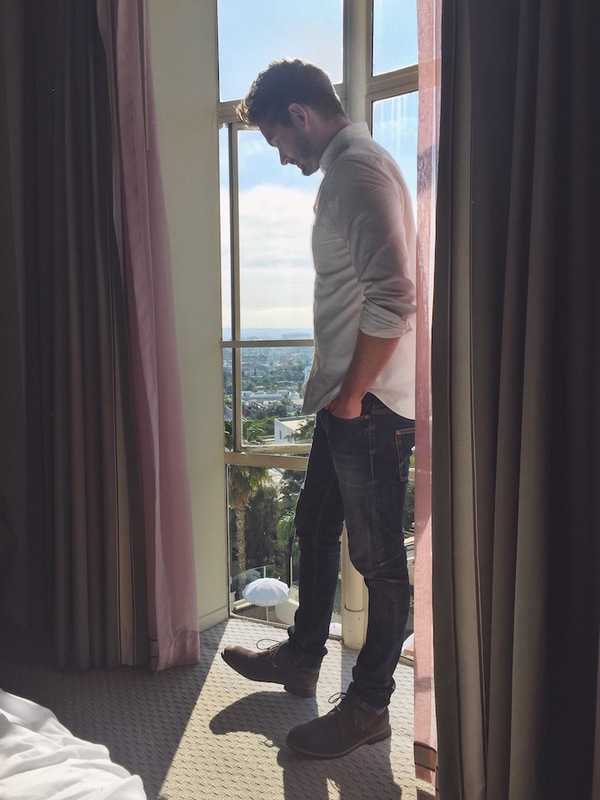 Taking in the sunshine and views from the room. // Later that night, I traded in my jeans for a pair of chinos to go with my RockportClassic Break Chukka boots and a slim-fit white oxford shirt from J.Crew. 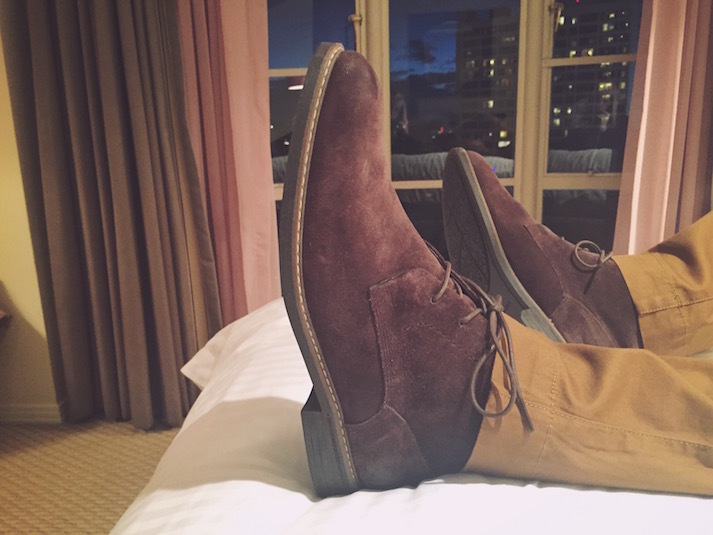 The Classic Break Chukka boots can be dressed up or dressed down — so if for space or convenience you only just want to bring one pair of shoes with, they’re a great choice. Relaxing in bed before heading downstairs to The Tower Bar. // Not pictured: me with a slice of pizza from my favorite pizza place in LA (Vito’s Pizza) in one hand and a glass of champagne in the other. My drink of choice for the night: dirty vodka martinis with blue-cheese stuffed olives. // The lighting, in addition to the hotel’s no-photography policy in the restaurant/bar areas made it impossible to capture more of my New Year’s Eve experience beyond this one photo. As mentioned, celebrities are a common sight here (during my stay I saw John Mayer and Bill Murray) so you can understand that the hotel asks people not to take photos (to protect the privacy of their famous guests). 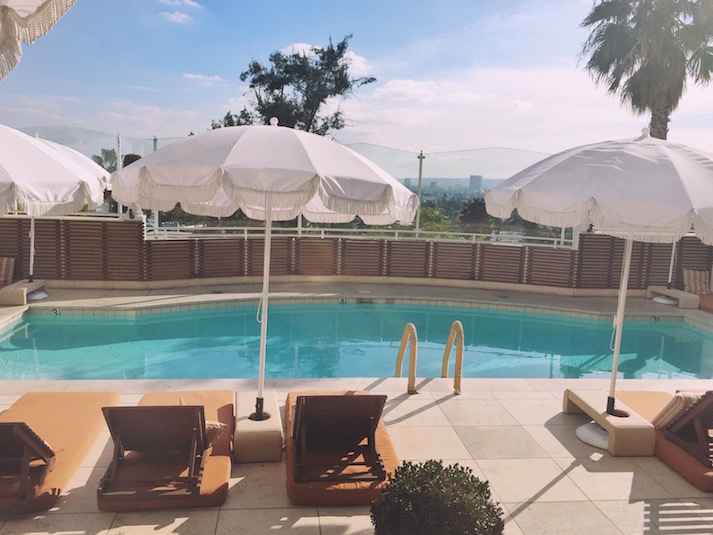 This is, however, more reason for you to visit and experience the Sunset Tower and The Tower Bar for yourself! 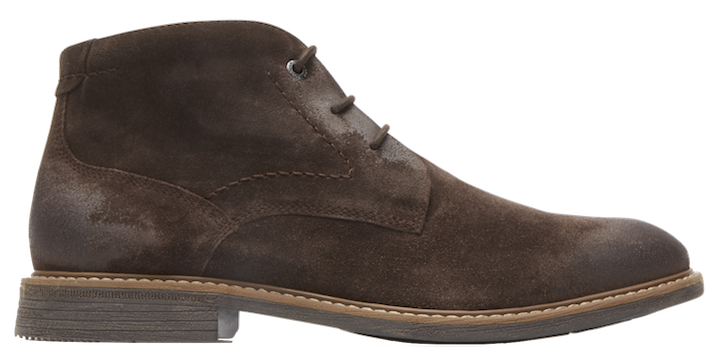 Featured Boots: Rockport’s Classic Break Chukka — Made of leather and suede, these boots feature a classic profile which allows them to be worn from day into night (they go with anything from jeans to a suit). They’re also extremely comfortable with their soft-knit lining and shock-absorbing heel. Thank you, Trevor, for this beautiful post. Fascinating writing. Hey Matthew. Really glad you liked it. Thanks for letting me know. Hi Trevor, totally rad post. I spend every Christmas in the LA area and it is nice to know there are some excellent trails out there. I’m going to check out Topanga State Park next time I’m out there. Hey Nate — Thanks! Topanga State Park is a hidden gem. Leave a Reply to Matthew U Click here to cancel reply.